Learn easy crafts to make and sell here, so you can start your own Etsy account and put your craft skills to good use earning some extra cha-ching! Making custom bracelets is fun, especially when you can customize it in any color and size you want. So take your pick which beaded bracelet here to make and sell, because they’re all beautiful! Beaded bracelets are one of the most popular products at any craft fair, too. If bracelets don't appeal to you, try your skills with these DIY necklace ideas. But you can also make both—a matching set of bracelet and necklace. Quite an idea, we think so, too! Jewelry is always a go-to for easy crafts to make and sell, you know! There’s no better way to spoil a furry friend than by baking them homemade treats. And there's a way for you to market to pet owners with a lot on their hands. If you can whip up more, sell them to pet lovers in your neighborhood. You may also supply a pet shop, if you're lucky, too! Clinique bags are enviable, but not always affordable. 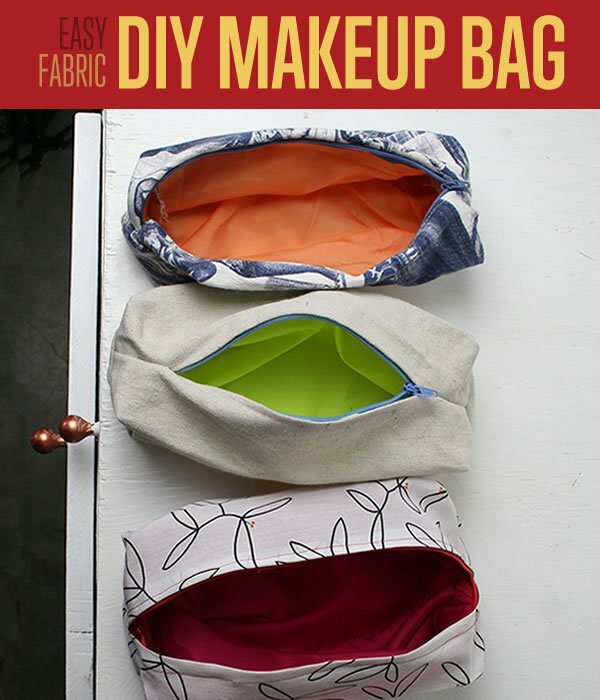 This easy tutorial of DIY makeup bag will give the same style without the hefty price. It isn't a signature brand, but cute and handy, nonetheless. Love bags and sewing? Here’s a project that utilizes the two things you love. Make two versions of this DIY tote bag and say goodbye to pricey store-bought tote bags. You can also design it with prints and add it to your list of seasonal holiday crafts. Customize and design regular picture frames and sell it for a premium price. I’m sure you’ll have lots of fun crafting while earning with this DIY picture frame with mosaic tiles. Home craft ideas for adults are some of the things that sell fast, after all. Going to a music festival? It's the perfect opportunity to have fun and earn by selling these lovely flower crowns. It will be a hit DIY craft for teens! You can also make it a profitable Valentine's Day craft by using roses. Candles are the perfect way to add accents to any room. These color block crayon candles are a fantastic addition to any space, and they’re one of the best-upcycled craft ideas for recycling broken crayons. Every bedroom needs a pillow. So, learn how to make a fat quarter pillow and make it in every color you want. You can turn this into an upcycled craft for old clothes and bedsheets, then, start your small pillow business! Fat Quarter Definition: Commonly used for quilting, it is a popular measure of fabric cut to 1/4 of a yard, or around 18 inches by 22 inches. With a pillow craft idea, throw in these decorative throw pillow covers to jazz it up! You needn't worry about your sewing skills because this beautiful sewing project is quick and easy to make. If you're looking for Christmas crafts to sell, you can decorate the throw pillows with Christmas trees. There’s always a space for one more lamp in the house, especially if it creates such a stunning light effect. This functional handmade home decor is perfect for any room and is one of the simplest crafts to make at home. A great gift idea and perfect for a night of relaxation. With endless possibilities too, because you can customize it in a variety of styles, scents, and colors. It's a sweet gift for Mother's and Father's Day to help them unwind. Sew up some dog collars to start selling crafts! Make them in various colors and patterns to give style to any furry friend. I'm positive any pet lover would love to have it as a gift for their four-legged pals. This chic gold foiled pencil cup will add decor to any desk and it's a cinch to make. Start by spraying white paint on a glass tumbler. Once the paint has dried, apply thin strips of double-sided tape. Then, peel off the backing and stick on the foil. Finally, unravel the foil, and start photographing your beautiful masterpiece. When making these keychains, start by cutting the clay into your desired shape. Then, stamp your letters on using a clay emboss kit. Once you’re done, poke a hole at the top and bake it in the oven until the clay has hardened. When it’s ready, insert a jump ring through the hole on top, then loop in a smaller jump ring as well as a key ring after. This easy DIY is one of the classiest crafts for adults. These DIY champagne flutes would make super elegant wedding gifts. Did I mention all you need to do is to place a few gold dots using pointed Q-tips and gold nail polish? When making this homemade calendar, remember to place painters tape on the sides of the board first. This will help you mark off the chalkboard area. If you're looking for crafts for kids, try making this DIY project with them! Make your own handmade crystal geode with an eggshell, food coloring, glue, and alum powder. This tutorial uses fake eggshells from Walmart, but if you’d like, you could opt to use real eggshells instead. Be sure to be very delicate when handling and selling them as they tend to break easily. Feel a hint of nostalgia as you set your eyes on this flowery Perler notebook. Add it to your list of kids crafts and make it with the family. By the way, don’t forget to place a weight on top of the Perler while waiting for it to dry. These handmade key fobs are a cute way to store your keys! They're perfect for someone like me, who tends to lose their keys in the bottom of their bag, I highly suggest picking a fabric in a striking color so it’s easier to find. This is surely one of the easy crafts to make and sell since everyone uses keys! This picture wreath is a great homemade decor to show off your photos without stocking up on too many picture frames. Remember, your main item for this project are the clothespins. So the more you have, the more photos you can display. Upgrading an ordinary clock with a few strips of washi tape places this on the list of easy crafts to make and sell. Let out your spirit for arts and crafts and go crazy by picking out a design with all sorts of cute and funky patterns. What Is a Washi Tape? It refers to a colored and decorative type of adhesive tape. If you're looking for alternative Valentine's Day gifts that'll last longer than a bouquet of flowers, try these handmade roses. These DIY metal roses look so punk chic—perfect for Valentines, indeed. I especially love how the embossing tool gives a unique texture to the flower petals. Looking for recycled crafts ideas for your kitchen? Get a new homemade decor by upcycling a cutting board into a DIY clock. You could do this easy DIY with any scrap board you have at home as well. Tip: Don’t forget to leave a few points or marks for easier time references such as 12 noon, 3 pm, 6 pm, and 9 pm. This crafts DIY is one of the best craft ideas you'll come across because of its dual purpose. You'll have an easy time selling this handmade craft because a ton of gardeners will be interested in this kind of apron. Tip: Get rid of those pesky fraying edges by sewing on a zigzag stitch. Give plain flats extra flair by attaching laces on them. They’ll look perfect when paired with a knee-length skirt. Make sure to sew on pieces of ribbon for the loops. They’re much easier to thread through compared to a suede cord. Did you know you can create your own paper from recycled strips? You can even place some leaves or flowers on it. This is one of the easy crafts to make and sell that you can customize! In fact, it's one of the handmade products that sell well. It could also very well be one of the top-selling homemade crafts. You'll have an easy time selling crafts like these cactus pincushions because of how adorable they are. Remember to fill the cushions with a good amount of stuffing to help the cactus stand upright. These pencils look so elegant when wrapped with pretty strips of origami paper. You can also try your own design ideas by using other types of paper for this easy DIY. Here's an idea: Try selling them in packs of three or more! Ensure a clean line by laying a strip of tape down the middle of the nugget. Place a layer of gold paint and wait for it to dry. Then, attach a small magnet to the back and have an easy time selling this eye-catching decor! These felt ball necklaces are one of the lightest necklaces ever. Another great thing about this arts and crafts project is its endless possibilities. See for yourself by experimenting with different lengths, colors, and patterns. DIY a succulent people can use in their homes as decor. This is one of the best craft projects for upcycling because it uses egg cups as planters. Remember to make a cactus mix with potting soil, pumice, and coir because it's the best soil for succulents. This jewelry box is a gem on its own because it holds three layers inside. The cup can be used for storing earrings, while the medium and small discs can hold bracelets, necklaces, and rings. These handmade bezel resin hearts are so intricately designed, with its use of beads, cabochons, and various jewelry pieces. Don’t worry about using too much glue in this DIY, as the glue will turn clear once dried. If you already have an air cutting machine on hand, then this prism sculpture project will only cost you about $3 to make! Just imagine how much you could sell them for online! All you need to do is cut 6 pieces for a cube prism and 3 pieces for a pyramid prism. The secret to making these Anthropologie-inspired matchstick earrings lie in the hammering. If you hammer until the frames lay flat, the earrings will be stronger and won’t bend easily. If you need coasters at home but don't want to buy them, try making your own! All you’ll need for this project are some cork coasters, paint, vinyl, stencils, and a paintbrush. This easy DIY uses both the silhouettes and its cutouts to make the pattern on the coaster. This project is a way to make time-outs more bearable for you and adorable, too. They will surely be a hit among hands-on parents. This DIY time out stool project is bound to be a great conversational piece that would be an easy craft to make and sell. Kids love falling asleep in the car. Make sure they're extra cozy with this easy craft idea. It’s comfy and the kids will absolutely love it. It's perfect to keep the kids comfortably tucked in the car. This Amigurumi cactus is absolutely adorable and you'll have an easy time selling it. A cute matching pair would be one of the best Valentine's Day ideas to sell. You can also make a family set and sell it as the perfect gift. A quick and deceptively easy, yet stylish, handmade braided headband can make a big difference in giving your outfit a trendy twist. DIY ideas like these are definitely great for selling at any craft fair or festival. Swipe on a touch of pink with this homemade lip balm recipe. It's super easy to make and has a delectable scent. Add a touch of strawberry flavor oil and an optional pink colorant to give lips a sheer wash of color. If you want a customized set of coasters, you can have fun making your own! A cool set of colorful coasters is great functional decor in any home. Get your base tiles and take a look at the bonus guide to start crafting these handmade coasters! Who doesn’t love homemade body scrubs? The best part about craft ideas like these is that it’s all natural. Don’t you want more easy crafts to make and sell that are good for your skin? Have fun selling these body scrubs and trying them out for yourself! A lot of people have smartphones and this cute charging station will surely help you get started with your crafty entrepreneurship. This is one of the more ingenious DIY ideas you can sew in a flash. Get creative when choosing the fabric designs. Deny it as you may, there may be a comic book nerd deep inside you. If you’re planning to go to Comic-Con, why not make a batch of these easy comic book magnets? You can sell them by piece or as a set! This is a super easy craft project that isn’t just a headband but can double as a necklace as well. Let your inner princess rejoice at this super cute DIY jeweled headband/necklace! You can also make it match your handmade beaded bracelets and braided headband. With a lot more people going green, this is one of the easy projects to make and sell that will be a hit at supermarkets and other stores. Crafty DIY projects like these are great for the environment or your crafting business. This will make great giveaways for parties and even intimate gatherings. The best DIY crafts are the simplest ones and something you can make at almost no cost at all. This decorative piece is definitely great for business! This rope bowl only looks pricey and hard to make, but it's actually made only with some inexpensive bowls, a length of rope, and a glue gun. Make your own rustic rope bowls in minutes and you will be able to create a ton to sell in no time. Experiment with different types of rope and jute so you can present your customers with a variety of choices. Looking for DIY mason jar crafts to sell? This Chevron pallet mounted hanging mason jar vase offers a perfect touch of rustic beauty, making it a highly marketable piece. If you have some spare mason jar and pallets, you must give this craft a go! These adorable, customized coffee cup sleeves are bound to be a big seller because they are brightly colored and machine washable. Every coffeeholic will surely love to get their hands on one of these handmade cup sleeves! Print pictures on wood with just wax paper and an inkjet printer. It's that easy and it comes with amazing results! It's the perfect DIY to give your home some unique decor. You can do this on most types of wood, too. These yarn ball bookmarks are so chic and cute sure to become a bookworm's favorite. What's great about this craft? Aside from being very easy to make, these are normally small in size, so you can make your materials go a long way. Sharpen your wood burning skills and create some etched cutting boards. You could even personalize them for special orders. Remember to buy the cutting boards in bulk and on sale so you can cut down on costs. One of the best rustic wood crafts to make and sell are these pallet plaques. Upcycle wood pallets and turn it into a cool picture frame or a clipboard. This fun piece of wooden art will be a perfect addition to home and a profitable project as well. Do you have leftover ceramic tiles from your last bathroom project? Well, don't just throw them away. You can still make awesome coasters out of them. All you need is watercolor and a bit of creative juice. This project is definitely one of the most artistic sellable craft ideas you can do this weekend! There are plenty of cool creative things to make if you want to start your first foray into entrepreneurship! All these easy crafts to make will surely get your artful hands tingling with excitement! Set aside a weekend for these easy crafts to make and sell. Try to make a few batches and sell some of them at a nearby crafts fair. After all, it wouldn’t hurt to try making some cash off of your DIY hobby, right? Enjoy DIYing easy crafts to make and sell and let your business take off! Which of these easy crafts to make and sell will you start you little crafty business with? We're excited to know! Let us know in the comments section below. Editor’s Note: This post was originally published on May 30, 2018, and has been updated for quality and relevancy.